This worm is in danger! Quick. What's the easiest way to kill worms? Besides poison or fire? While you think you're taking care of them? Answer: Exposing your worms to air. Can't tell you how many times I've heard something similar to this and I cringe every time: "I ordered 200 worms and I only got 199. I know 'cause I counted them 10 times to make sure." Or: "I've counted my worms in my worm bed and it's got 9,314 worms. Is that too many?" First of all, you don't need to know the exact count of your worms right down to the last individual. Unless they're cupped bait (which is generally around 24 worms and can be counted quickly), finding the exact count of worms in a bag or bed is just not that necessary. Secondly and more importantly, the act of counting each and every worm right down to that last individual hiding under that last bit of bedding is actually very harmful to the worms and can kill them. Why? I'll tell you why. Worms hide under bedding for a reason. The light rays hurt them and the air dries them out. Quickly. So when you meticulously pull every worm out of that bedding saying "five-hundred and eighty-seven", and then, heaven forbid, leave the poor guy lying around exposed while you continue counting, that worm is drying out immediately and the harmful light rays are sickening it immediately. Now, the worms won't die right away except if they're left out for an extended period. But they are at risk of getting sick and you'll be wondering later, "Why are my worms crawling around aimlessly on top of the bedding?" "Why are my worms balled up in the corner." "Why are my worms smaller." "Why are my worms dead?" Worms exposed naked to air dry out very quickly. Because they are comprised mostly of water and the water evaporates easily, you can actually see them loosing weight. You may start out with a pound of worms and by the time your done counting, you may only have half that amount. Plus, the stress on the worms is harmful and will set them back weeks in their development. The skin of a worm is highly sensitive to light rays. The light is actually very painful, which is why leaving a light on over a bed keeps worms from crawling. Worms avoid light for a reason. When you're pulling them out of the bedding for counting (or transferring, for that matter), the worms receive harmful, burning light rays to their skin. Once again, this sets back their development and can sicken them to the point of dying. So, how are you going to get a count on the worms you have, whether you ordered a bag or you're selling a pound of worms to a customer? If you've just received a pound of worms you ordered, weight the bag of worms. The worms were shipped at just under 2 pounds (1 pound of worms and the rest moist bedding). Taking into account the loss of moisture during transit, the bag should weight around 1 pound 8 or 10 ounces. If you dump your worms into a tray and toss the worms to evenly distribute them, you sound see an even amount of worms to bedding. If you're serious about knowing the exact amount of worms and really want to count them, have a separate tray of bedding to toss the worm into as you pull them out of the original bedding. Throw some bedding over the worm immediately and continue counting. Limit the amount of exposure the worms have to light and air to an absolute minimum. Oh, and spritz your worms with some non-chlorinated water after you're done to replace lost moisture. For aspiring worm farmers, my worm farm manual has some quick and easily methods of counting your worms without actually counting every last worm. Plus a whole lot of other tips and how-to's. My Worm Farm Manual comes in a hard-copy or digital download. Get all the information you need on worm counting and worm care in one handy manual. Order a Digital Download now. Looks get back to looking at what valuable products you can produce via vermiculture. Last time we examined the most precious product that brings the highest price: Worm Egg Capsules (cocoons that contain worm eggs). Next on our list is #2 Worms. Earthworm production is the most common reason folks start a worm farm. The earthworms are, of course, the most important component of a worm farm and will be your most sale-able item. And worms give you all the other valuable products to sell listed above. 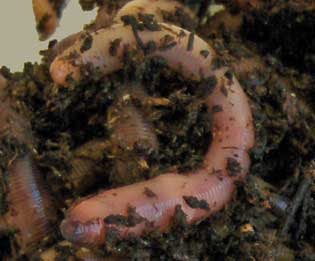 Worms are the "vermi" in "vermiculture". From the Latin worm vermis meaning worm, they are the machine of your vermiculture business. So pay them well....with rich, organic food stuffs and manures, just-right moisture, zero light, safety, peace and quite. When compared to other means of production, earthworms work cheap. Most of the food stuffs can be found for free or nearly free. The same goes for bedding. They don't require fancy buildings and office furniture. Just a nice fluffy, moist bed with low light. And they don't talk back. As we discussed the the posts about earthworm markets, there's a ready demand for worms most anywhere in the country. Earthworms have real value. Whether as fish bait, vermicomposting bins, pet food, or soil enhancers, worms are (almost) worth their weight in gold. That's why the egg capsules are your most valuable resource: they're the source of your future worms and without them you won't have any worms to sell. So, which came first, the worm or the worm egg capsule? Worm farming start-up costs are surprisingly low and you can do it yourself or with family. It doesn't require a lot of room. Most anybody who can take care of gold fish can take care of worms. And it doesn't require a lot of education. Solutions to problems and ways to avoid them. Get started worm farming today. Order a digital download or hard-copy now. Q: Why aren't my worms breeding? A: There are a few reasons worm can stop making babies. 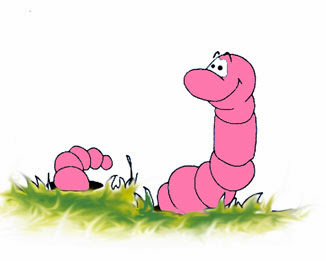 Examine your worm growing situation and see if any apply to you. The bedding needs changing. If the bedding is too concentrated with castings and broken down, the worms will do more than stop breeding. They'll stop breathing, too. Or simply start crawling. Solution: Change out your bedding as soon as it needs it. This timing can vary with how many worms you have in your bed and how much bedding material is in the bed. A good test is if the bedding is becoming compacted and you have to turn it more often (you are turning your bedding, aren't you?). The bedding will become fine and dark with castings. You're not feeding the worms enough. Worms, like any other living organism, will be stimulated to breed and lay more eggs if there's a plentiful supply of good, nutritious food. Solution: Feed your worms all they can eat. Duh! You're feeding your worms too much. Grain. Too much grain can make your worm bedding go acid and will make your worms sick. Conversely, though, sometimes when worms get sick they start laying lots of eggs. Go figure. Solution: Only feed as much grain as your worms can eat in a day and make sure it is finely ground. Clean off any uneaten grain before turning the bedding or adding more grain. Feed organic material and manures for safer feeding. The worms are unhappy. If it's too noisy, too hot, too cold, too...something, worms will be unhappy and an unhappy worm is not breeding. They're dying and they're crawling. Solution: Make sure you worm growing environment is conducive to worm breeding and worm happiness. If you want to improve on your worm breeding, fattening and selling, order your copy today. It's available in a download or hard copy version. What Products Are Produced From Worm Farming? These capsules or cocoons are excreted by the earthworm and contain worm eggs. Very precious indeed. I caution you to hang onto your worm capsules until you have more worms than you know what to do with. They are literally the future of your worm farm. They grow your business and are what make worm farming "sustainable". Eventually, if you're good at worm farming, you will begin to have more worm capsules than you need and you can part with them. But at a price. I'm talking $200-350 dollars a pound. At least. Gardeners can add the cocoons to their garden soil to improve it. Aspiring worm farmers like yourself can add worm capsules to worm beds and get a jump start on their worm farming business. You can do the same if you can find a worm farmer willing to sell you some. Don't look at me. My Worm Farm Manual has detailed instructions on how to harvest worm cocoons from your worm beds. 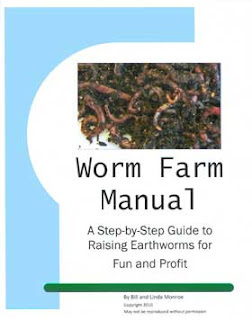 Worm farming requires specialized knowledge to be successful. Avoid expensive mistakes and get your worm farm started right. Order a download or hard copy and get going today.